The Chi-Chi is a sweet, vodka-based cocktail made with cream of coconut and pineapple juice. This is a tasty tropical drink usually mixed up by either blending or shaking with ice. It may be garnished with a pineapple wedge or a maraschino cherry or both. The Chi-Chi has been the official beverage of Puerto Rico since 1978. 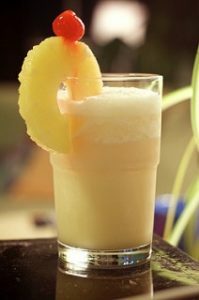 A pineapple and coconut delight for hot days, and the Chi-Chi is a wonderful tropical frozen cocktail that is something a little different than the average Margarita for holiday imbibers. We focus on teaching the Pina Colada… which you’ll get to in a moment. Mixing up a Chi-Chi is a pretty simple process. A few basic guidelines will keep your cocktail true to the original recipe. Note that this creamy tropical drink doesn’t need to be blended. Look at this also as a shake and pour cocktail if you don’t have a blender handy. Take your vodka, cream of coconut and pineapple juice and add all those to a shaker half full of ice. Shake vigorously to marry the flavours together and work up a good lather on the drink. When finished shaking, pour the contents into a tall glass and garnish with a pineapple ring. 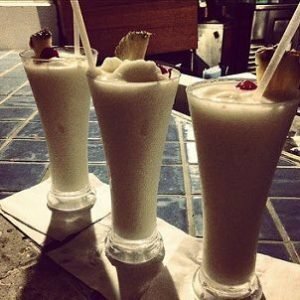 The Piña Colada is much more widely known than the Chi-Chi. The two tropical drinks are essentially the same other than swapping out the vodka for a nice rum. As a rum cocktail, the rum matches well with the pineapple and coconut to create a tasty cocktail perfect for sipping while lounging in a deck chair under the sun. The pina colada also works well as a shake and pour drink too. If you don’t have a blender around, don’t fret. Just take your ingredients and shake them up before pouring into a tall glass. Without all that blended ice in the drink your customers won’t suffer from brain freeze and can actually taste the ingredients without being watered down. If you like Rum, and a drink that seems like it should only be sipped while on holidays… consider the Blue Hawaiian as well! We teach both the Pina Colada, Chi-Chi and Blue Hawaiian in bartender training course. New rookie bartenders learn these recipes, plus 85 more, in only 2 weeks!